In the past, RaceTrac’s summer advertising was primarily a promotional campaign around Sodapalooza. But once the cups started selling out, RaceTrac was left with little to talk about. This year, to promote its summer offerings, RaceTrac is launching a new campaign: It’s Always Summer in the South. Based on the insight that RaceTrac knows summer better than anyone—based on their southern roots—the campaign comes to life in cinema, social, OOH, and digital display. And the cornerstone of the campaign is a branded content mockumentary that chronicles the story of award-winning British documentary filmmaker, Basil Crisp, as he attempts to document summer in the South. However, he finds the task to be more challenging than expected, as he and his crew struggle to endure the unrelenting heat. Luckily, they meet a local RaceTrac employee named Jamie, who guides them along their journey and shows them the South’s favorite summer traditions – such as Swirl World and Sodapalooza. The unlikely trio embark on an epic road trip, mingling with locals, stopping at RaceTracs, and enjoying a few too many free refills and adventures along the way. The goal of the campaign is to try drive preference for RaceTrac during the summer, the busiest season for convenience stores and gas stations due to road trips, family vacations, etc. The campaign’s objectives are to drive in-store sales, build the brand and stand out from the competition. All accomplished through various elements of the campaign. Knowing that social and digital channels as well as video content works really well for RaceTrac, we wanted to create a content series that would be perceived well on those channels as well as in cinema. 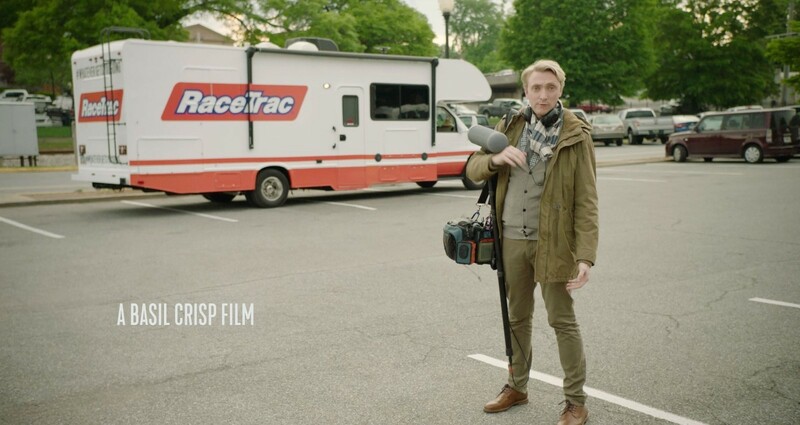 Best practices indicate that shorter content performs the best on social, so the challenge was to tell the story of why RaceTrac knows the summer best in the mockumentary format and communicate the promotion in short :30 or :15 snippets.